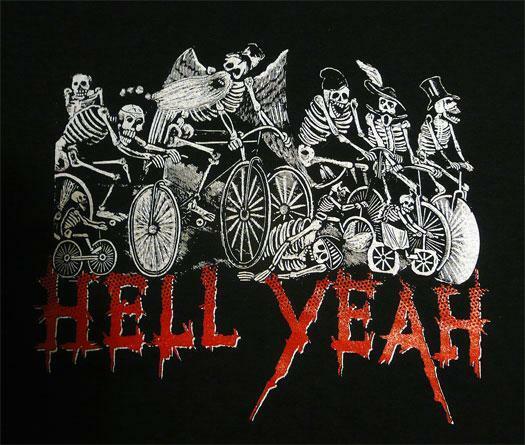 I just got my new Hell Yeah shirts back from the printers and they came out really well! Based on the Juan Posada print. Click here if you’d like to purchase one of these fine garments. Remember, black will always be the new black. But having said that I do have some other shirts for those who shy away from the darkside. Really nice and simple. Check out some Darkthrone if you’re feeling the Nargoroth vibe! Just out of interest who did your sleeve? I like Darkthrone – the guy flipping you the bird at the top of the page is Nocturno Culto! Thomas Hooper did my sleeve – he’s so good! Haha my bad! I wondered if it was him, but didn’t want to go all out! One of my friends writes blogs for cooler, so I was reading that and saw your article and the tattoo – the detail is amazing! He’s based in NYC though isn’t he? Thanks for getting back to me on that, his work looks incredible. Do you know of anyone UK based with a similar style? I was looking at Louis Molloy for his shading skills. What did you think of the pedal t-shirt? who is it at Cooler? Maybe I know her? Well I dont know anyone in the Uk who is similar to Thomas and I have been looking into it! Its kinda good though as it means I am having to wait till I go to New York for more tatts rather than just getting covered right away! I like the pedal shirt! I like your plan, I guess it’s a cool souvenir to have of your travels – you could almost go on a tattoo holiday and make up another sleeve from various places! I’ve been looking into UK artists, but can’t seem to find anyone either, this Molloy guy just seems to be good at B&W and shading. It’s a girl called Catherine, who works for them, she’s out on a season in Morzine and she’s writing some blogs for them on their website, sounds like a pretty sweet deal to me! So how long have you been riding fixies for?